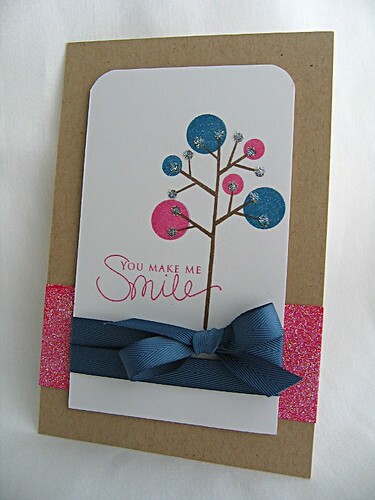 The glitter and the double layered ribbon really accent this card perfectly! Great card Maile! I love the little pops of colour and the accents of glitter on the tree! Love this! Clean & simple with just the right touch of 'glam'. Great colours - never would have come up with that on my own! This card just made my heart skip a beat, completely and utterly FABULOUS!!!!!! Great color choices Maile! Thanks for choosing Enchanted Evening, my favorite--I'll definitely be playing with your combo! 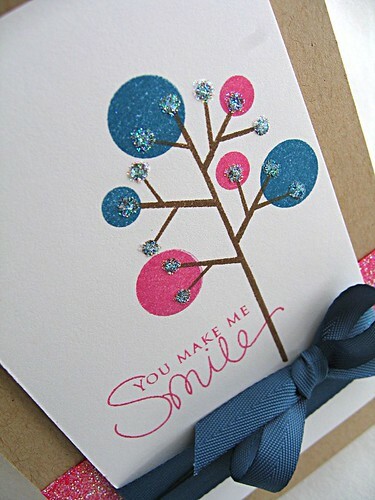 Your card is so fun--I love all the glitter on the tree, reminds me of ice on branches! I love this card! So beautiful and simple, with just the right amount of bling. I can't wait to play in Nichole's challenge when I get home tonight! This is so pretty! I love that you're on the PTI team! Your cards with their products are always BEAUTIFUL! They are so pretty again. What a great card! Love the color combo you chose. All the bits of glitter are perfect. Cute! Love your little sparkly tree and the ribbon is so pretty! How I love this combo! Makes me think about my childhood and how I loved the blue (or dark blue) with pink! ;-) Beautiful piece of art! No wonder you love these colors...you make them look so FAB!! !